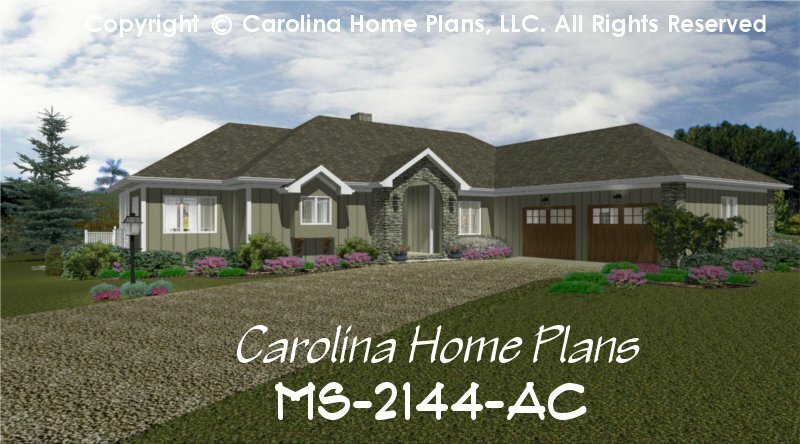 Prairie style windows and contemporary layout define this gracefully convenient one level midsize house plan. Featuring a cathedral ceiling living room, stone fireplace and a dramatic window-wall to capture sunlight or views this spacious yet medium sized floor plan is ideal for down-sizing retirees or single occupants. 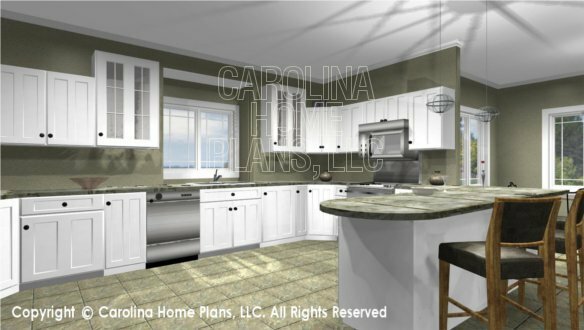 The large kitchen with its ample cabinet and counter space also features an eating lunch-bar; and is convenient to the morning room, dining room and screened porch for easy entertaining. The private study serves as a small away-room but can double as a third bedroom when needed. The large master suite features a luxurious bath complete with separate tub and shower as well as 2 separate sinks. 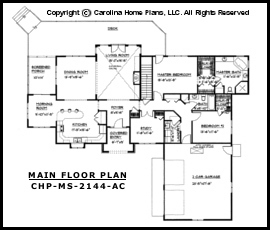 The attached two car garage, convenient main level laundry and ample closet space make daily chores a breeze in this affordable mid-sized house plan. 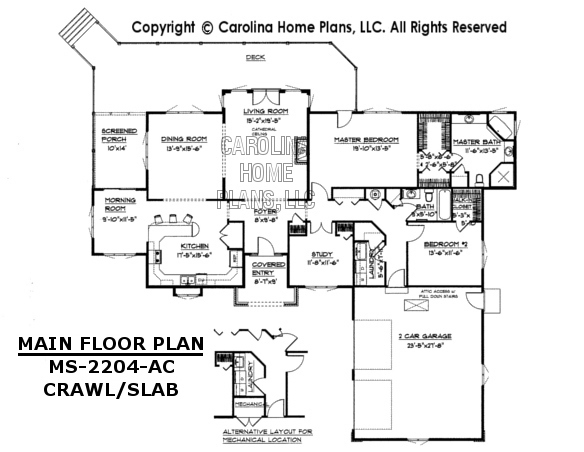 This comfortable home plan also has a full basement for a workshop or future expansion; (crawl space or slab available). Simple, yet elegant lines ensure a cost-saving building structure without sacrificing aesthetics and quality of life. Available options and pricing: See below. Having worked all their lives, raised a family and traveled the world this active retired couple wanted a comfortable private home that they could fully enjoy without the hassle of maintaining too much space. 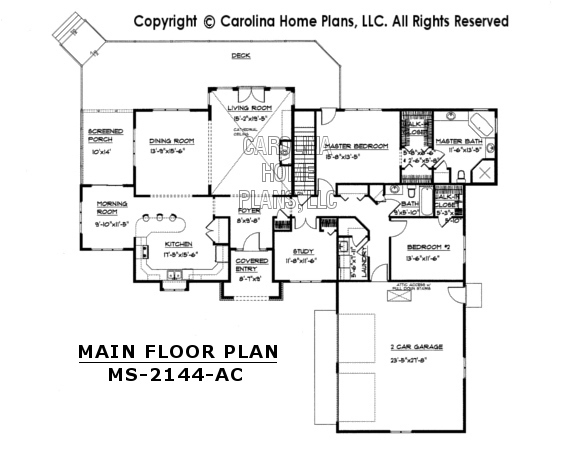 We designed this small home plan to gracefully accommodate each of their particular daily activities and needs. A culinary specialist, the wife loved to cook and entertain. A bright spacious kitchen with lots of counter space was a must. We created the kitchen to be open to a bright, fully windowed morning room as well as the spacious dining room. The covered screened porch is easily accessible from this much lived in area. The husband, when not playing golf, enjoyed quiet time reading in his study which also serves as a 3rd bedroom should they ever need more space than the large guest bedroom. 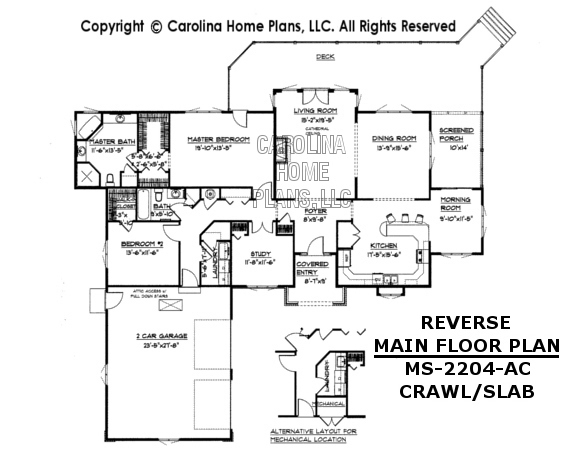 The convenience of a medium sized one level floor plan with laundry room and garage all on the main level was an important consideration in their down-sizing move. 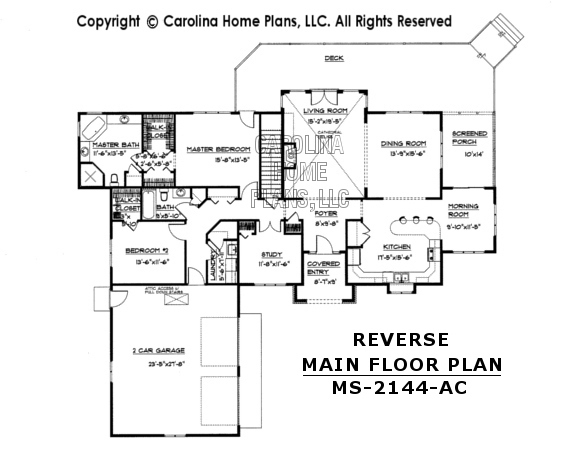 Contact us for questions about this plan Want a quote for modifications on this plan?